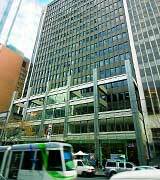 M-Power Accommodation offers corporate business travellers to Melbourne a range of high quality, executive-class, fully furnished, self-catering accommodation options in the CBD of one of Australia's most important corporate capitals. These apartments offer visiting executives the space to relax and the space to work. With spacious living areas, separate bedrooms, fully equipped kitchens, dedicated data ports for internet access and ISDN phone lines with voice mail as a part of the customary business services expected by the business traveller, they are as well located as they are well appointed. These executive apartments also offer an extensive range of services necessary for long stay relocations, corporate accommodation and for the overnight business trip. These include, but by no means are limited to, 24 hour reception and concierge, full and modern business centres, on-site restaurants and bars, 24 hour room service, a range of meeting rooms, gym and fitness rooms, swimming pools, saunas and, perhaps most importantly, on-site and secure city centre parking. Feel free to ask us about additional features such as express, late or early check-out and check-in times that may help to ensure that you optimise your business trip in Melbourne. 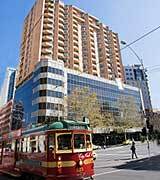 These central locations offer ready access to the majority of Melbourne’s corporate and government headquarters while also offering the convenience and style of nearby restaurants, bars, shopping, sightseeing, sporting and cultural venues, be they for yourself or for accompanying partners and associates or families and loved ones. 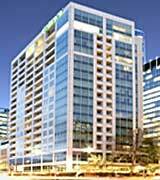 Oaks On Collins is a 20 story, 4.5 star hotel apartment fashioned on New York-style living. 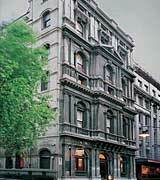 The apartment hotel occupy an enviable location in the centre of Melbourne's bustling CBD overlooking rows of elm trees and beautiful Victorian architecture. Oaks on Collins presents its guests with a stylish urban sanctuary, contemporary studios, executive studios (some with private balconies and/or views), rooftop apartments and spacious Cosmo apartments all of which have been tastefully furnished and feature all the modern conveniences one expects of a quality hotel apartment. Seasons Heritage Melbourne is located on the forefront of Albert Park Lake, home to the Australian Formula 1 Grand Prix. It's positioned just outside Melbourne CBD, making it perfect for guest who want a break from the hustle and bustle after a day of sight-seeing, shopping and dining. The 4 star, luxury apartments are within easy reach of the trendy Chapel Street, Prahran and South Yarra famous for the boutique shopping, cosmopolitan restaurants, cafes and bars. 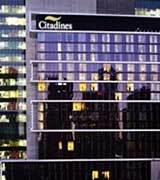 Citadines on Bourke Melbourne is a stylish, recently built, Melbourne serviced apartment building in the heart of the city's CBD. 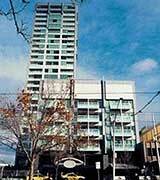 Adina Apartment Hotel Melbourne Northbank is located in the heart of the CBD close to Melbourne Aquarium and walking distance from Melbourne's great nightlife, laneways and bars, boutique shopping and world-class entertainment & sport. 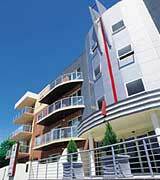 Park Regis Griffin Suites is a located in the lively suburb of St Kilda, just outside Melbourne CBD. 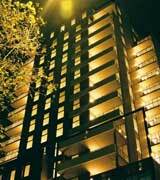 For those who want to experience Melbourne as the locals do, Park Regis Griffin is a great choice. 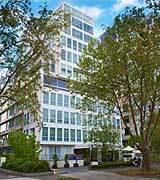 The apartment hotel is close to St Kilda Beach, Albert Park and trendy Chapel Street on one side and the National Gallery, Melbourne Theatre Company, the Myer Music Bowl and Royal Botanic Gardens on the other. A tram stop directly opposite the hotel makes exploring Melbourne CBD and its surrounds so much more fun. Oaks on Lonsdale is a 4.5 star apartment hotel with a great city CBD location, self-contained convenience and quality features. 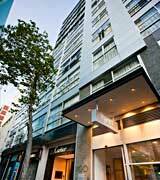 Located on Lonsdale Street the hotel apartments are only a short walk to Parliament Train Station, Bourke Street Mall, Federation Square, Chinatown, Princess Theatre and the CBD shopping, entertainment and dining hubs. Located in the heart of Melbourne's CBD, Somerset On Elizabeth is surrounded by a plethora of shops, restaurants, cafe's and cultural and entertainment venues. 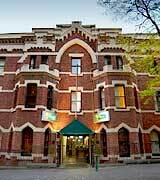 For the business visitor, the hotel's proximity to government and business offices and transportation links makes Somerset on Elizabeth perfectly placed for both corporate guests and tourists alike. 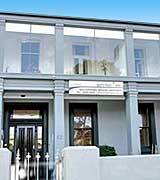 Adina Apartment Hotel South Yarra is located just outside Melbourne's CBD in the heart of trendy South Yarra. From your hotel, you can wander through some of Australia's most innovative designer shops and fashion boutiques in Commercial Road and Chapel Street, visit the Jam Factory's entertainment complex or take a quick tram ride to nearby Toorak or the CBD. 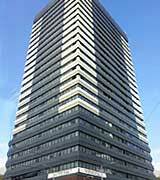 Located on Market Street, the city's financial and legal district, the towering 4.5 star Oaks On Market Apartment Hotel merges the convenience of its location with stylish apartments. The hotel is a few moment's walk to the best shopping and eateries Melbourne has to offer and, because it's so central, it's surrounded by public transport giving easy access to other areas of Melbourne and beyond. Mantra 100 Exhibition lies in the heart of Melbourne less than 15 minutes walk to some of Melbourne's most iconic landmarks. Take a walk to Federation Square for coffee, do a bit of morning shopping in Bourke Street Mall, dine out a Chinatown then catch a show at the Regent Theatre or see a game at the Melbourne Cricket Ground. The 4.5 star Seasons Botanic Gardens is located in tree-lined St Kilda Road, just outside Melbourne CBD and overlooking the beautiful Botanic Gardens. A short tram ride will take you to Southbank, the Arts Centre, National Gallery of Victoria and the Convention Centre. Over the bridge and you're in the heart of the CBD and its corporate offices, entertainment, shopping and dining precincts. 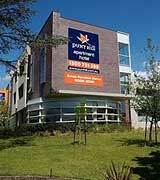 Punthill Burwood Apartment Hotel is located in Burwood a suburb just 14km east of Melbourne's CBD. The comfortable apartments surround a central courtyard, landscaped gardens, heated spa and BBQ facilities. 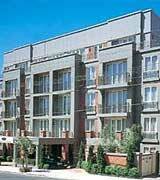 The apartments are contemporary in design and feature modern conveniences. Guests have a choice of 1, 2 and 3 bedroom apartments all of which are climate-controlled and have separate bedrooms and full kitchens. 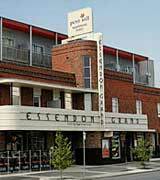 Punthill Essendon is located in the vibrant, cosmopolitan suburb of Essendon, just 14 kilometres north of Melbourne CBD. Contemporary and very stylish, the studios and 1 & 2 bedroom serviced apartments are surrounded by the charming art deco architecture of the Essendon Grand Hotel. While Mantra on Little Bourke lies in the centre of Melbourne's CBD, it feels more like a secret hideout tucked away from the well-worn tourist tracks. 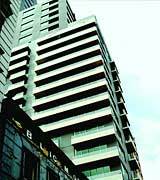 Adina Apartment Hotel Melbourne Flinders Street is perfectly placed if you wish to experience all that's Melbourne. The hotel apartments are located one block from Federation Square where you can walk to the city’s venues, landmarks and world-class dining. Melbourne’s famous laneways are just across the road while Southbank's popular restaurants and bars are a stroll across the Yarra River Footbridge. 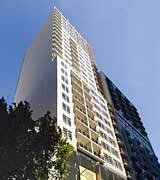 Mantra on Russell is a recently built 4.5 star apartment hotel located in Melbourne's CBD - adjacent to Chinatown. The hotel is within walking distance to Melbourne's bustling shopping hub, major tourist sights and nightlife precincts. 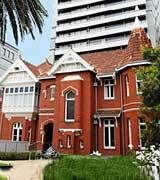 Located in the heart of the Melbourne city, in a National Trust listed property, Quest Gordon Place offers unique and stylish accommodation, excellent facilities and personalized service for leisure and business guests alike. BreakFree Heritage on Little Bourke lies smack-bang in the middle of Melbourne's famous shopping and theatre precincts and surrounded by a plethora of delicious dining options. To take in the sights in a purely Melbournian way, hop on one of the many passing trams. 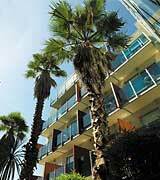 Adina Apartment Hotel St Kilda is situated in the heart of St Kilda just outside the CBD. Stroll along Acland and Fitzroy streets and	sample the cosmopolitan eateries and cafés, the bohemian designer shops and alternative live music venues or walk to Luna Park or the bars in the Prince of Wales Hotel and Hotel Esplanade. 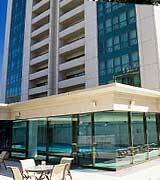 Mantra on the Park Melbourne is a 4 star apartment-style hotel located on the northern end of Melbourne's CBD. It's location makes it easy to explore the CBD's designer shops, historic theatres, world-class entertainment & sporting venues and Melbourne's renowned dining. If you feel like staying indoors, relax at The Terrace Bar and Grill, in the sauna or in the heated indoor pool. 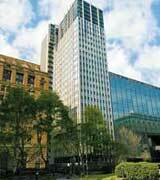 Clarion Suites Gateway offers 4.5 star, apartment-style hotel accommodation in Melbourne's CBD. Located beside the Yarra River -- opposite the Crown Entertainment Complex -- guests are provided with great views and easy access to Melbourne's main shopping, dining, business and sports precincts. The 4 star, Sixty Two on Grey offers boutique-style accommodation in the popular beachside suburb of St Kilda -- just 5km, or a short tram ride, to Melbourne's CBD and within easy walking distance to St Kilda Beach. While the high ceilings and marble fireplaces throughout preserve the character of the 140 year old building, each serviced apartment has its own ambiance. Quest Bayside St Kilda situated in a quiet residential street just a few minutes walk from St Kilda beach or cosmopolitan St Kilda - renowned for its variety of cafes, restaurants, boutique shops, bars, nightclubs and music venues. 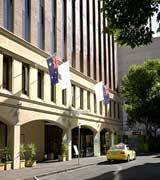 Melbourne CBD with its business and cultural precincts are just a short tram or taxi ride away.